The U.S. military’s stockpile of nuclear weapons is one of the most existentially terrifying arsenals ever assembled, and a conflict involving the detonation of even small percentage of those weapons could potentially destabilize the entire world. With a commander-in-chief who has shown a fairly incredible misunderstanding of how nuclear strategy works as well as a hair-trigger temper, it’s not surprising that some people are slightly concerned about a possible catastrophe. 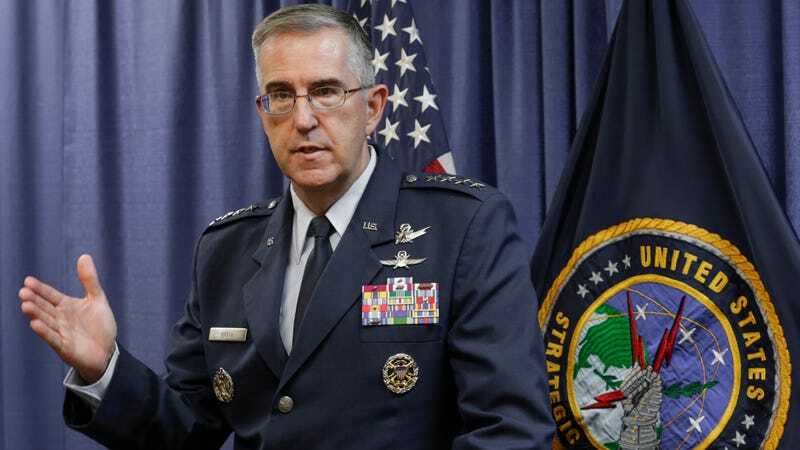 Calm down, U.S. Strategic Command chief and Air Force General John Hyten told attendees at the Halifax International Security Forum in Nova Scotia, Canada on Saturday. Strategic Command, which controls nuclear weapons in the event of a war, won’t let the president just lob nukes willy-nilly at anyone who angers him. It’ll only let the president legally lob nukes at enemies willy-nilly. Hyten’s remarks come after both speculation about the president’s mental state and the ongoing possibility of some kind of nuclear exchange between the U.S. and North Korea, which has already developed nuclear weapons but is still developing longer-range missiles to launch them on. It’s also likely intended as pushback against recent reporting emphasizing that the president has nearly total control over how the nuclear arsenal is used. While Hyten is correct that he and other senior defense officials would have the opportunity to consult on any launch if the president followed protocol, per Slate, the actual formal chain of command for nuclear launches is direct from the president to a one-star general at the National Military Command Center. Officials trying to interfere in that chain of command could probably be, uh, dealt with. As the Washington Post emphasized, once it gets to that one-star general, determining what is or is not an illegal order is not really a launch officers’ prerogative. Were it to even be so, as Slate noted, experts say the military has “devised legal rationales to justify almost any sort of nuclear attack that a president might want to order.” Perhaps legal concerns could prevent the president from an unprovoked nuclear attack on Pyongyang tomorrow, but one couched as a pre-emptive strike on the North Korean nuclear program could probably pass muster. And nuclear war would still potentially result in the deaths of millions of people, legal or otherwise, which is not really all that reassuring. Gulp. Come On Down And Boo Our Guests!